“The only things you can really count on in this world are death, taxes, and bills to pay,” Uncle Arthur would complain, usually as he was sitting down to pay yet another bill. Aunt Edna was right, and those gloriously colored harbingers of the changing season have been doing their spring thing for hundreds of years now. It is believed that tulips were first discovered as early as the 12th century. They were found growing wild by Turkish explorers in mountain and field areas of central Asia. By the mid 1500s, tulips were becoming popular throughout Europe and were valued by the wealthy gentrified class, thus encouraging the cultivation of new varieties and greatly increasing the prices of these new cultivars. Records show that in 1571 the botanist Carolus Clusius began cultivating tulip bulbs in Holland, thus initiating the birth of the Dutch bulb production industry. In the early 1600s, tulips were sent to France and a period known as “Tulipomania” came into full bloom with tulip bulbs being highly prized and traded as a valuable commodity. As the Dutch and English settlers came to America, they brought tulip bulbs with them. The town of Holland, Michigan, now a major bulb producing area in the United States, was founded in the early 1800s by a colony of these Dutch settlers. Tulip bulbs have now come to be undoubtedly the most popular bulbous plants of the garden in spring not only in the U.S. but in many other parts of the world as well, and even Thomas Jefferson, an avid gardener himself, planted tulips at his Monticello home. 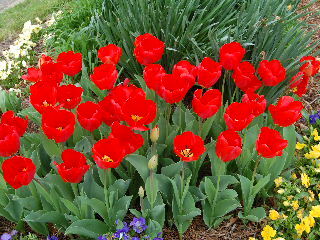 Tulips are hardy bulbs that prefer full sun and a sandy well-drained soil that is rich in organic matter. The bulbs should be planted during the coolness of the fall, usually in October or November, spaced with at least 3 to 5 inches between the bulbs. As you are planting, give thought to the color and planting pattern you are creating; an irregular pattern tends to produce a more natural look in your landscape, while clumping the bulbs together creates a more formal display. If the winters are especially harsh in your area, consider adding a layer of mulch after you plant. Also, if pesky rodents and squirrels are plentiful on your grounds, you might want to plant the bulbs in wire mesh baskets to keep your tulip bulbs from becoming food for the varmints. Add a little bulb booster fertilizer to the soil, water the area, and wait for the spring burst of color in your garden. After the tulips have finished blooming, cut the stems off to keep the plants from setting seed, which will only take energy from the bulb, but leave the remaining green foliage to help build food for the bulb to store. Some varieties can be left in the ground to bloom again in following years, but over time any tulip bulb will eventually wear out and will need to be replaced with new bulbs. 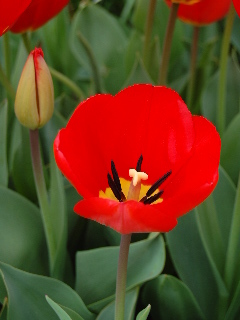 Tulips are available in a variety of colors from red to yellow, pink, white, orange, and in any number of variegated colors and bloom varieties, with the classic cup-shaped blossom being the most familiar. Tulips work well clustered or intermingled in the garden with other types of spring-blooming bulbs, especially daffodils and the lower-growing grape hyacinths.